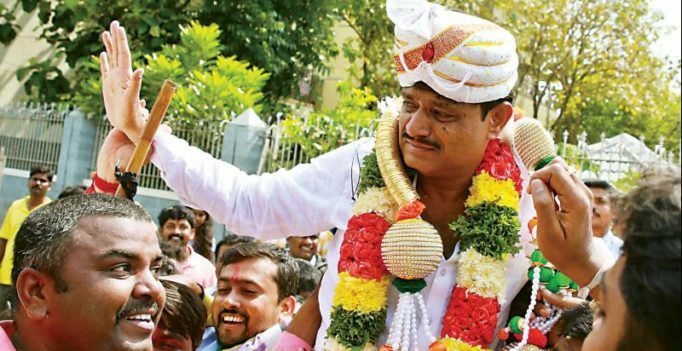 Bengaluru: Proving his critics wrong, especially those who expected him to lose on account of the Electoral Photo Identity Card (EPIC) expose, Congress candidate, Muniratna won by a big margin of 25,492 votes over Mr Tulasi Muniraj of the BJP in the Rajarajeshwarinagar (RR Nagar) assembly poll on Thursday. In a sign that the impact of the JD(S) wasn’t as much as it is in the Old Mtysuru belt, even JD(S) leaders like H D Deve Gowda and new choef minister HD Kumaraswamy had little impact with Mr Munirathna netting 1,08,064 votes, and maintaining the lead right from the start of counting . His closest rival, Mr Muniraju secured 82,572 voters and the JD(S) candidate A. H. Ramachandra had to be content with third place with 60,360 votes. The election to the RR Nagar constituency was put off by the Election Commission of India (ECI) after around 9,000 voter identity cards were found in an apartment in Jalahalli, just a few days ahead of the May 12 polls. It was alleged that Mr Munirathna was behind the scam, which was widely expected to dent the image of the Congress and make it tough for it to win from the constituency. While both the BJP and JD(S) tried to capitalise on the scam by running a strong campaign in the constituency, the voters appeared to have a mind of their own. Not only did JD(S) supremo, H D Deve Gowda and its state president, now Chief Minister, H D Kumaraswamy campaign heavily in the constituency, so did BJP national president, Amit Shah and state BJP chief, B. S. Yeddyurappa. To little effect. The two parties were banking on their Vokkaliga candidates finding favour among the large number of voters from the community in R R Nagara, but they seem to have split the Vokkaliga votes instead, giving the Congress the advantage in the election. JD(S) candidate, Ramachandra, who left the BJP to join the party after he was denied the ticket for R R Nagara, too bit the dust as his traditional votes were also divided between the BJP and JD(S), giving Mr Muirathna the upper hand.